One of the most enjoyable dish by my family. 2 medium potatoes cut into 4 halves. 1 tsp roasted zira powder. * U can roast the zira powder over tawa or in the oven. In a pot heat oil. Add cinnamon & cardamom, onion, ginger, garlic paste & fry for 2 min. Add the spices & tomato puree & fry for 5 min. Add the potatoes & toss for 3 min until all the potatoes are covered with masala. pour the water & bring it to the boil. Lower the heat & cook until the potatoes are tender. Mean while take the shells off the eggs & make 4 slits in it. Drop in the eggs & cook on low flame for 5-7 min until oil floats to the top. Remove from heat & sprinkle with roasted Zira powder . 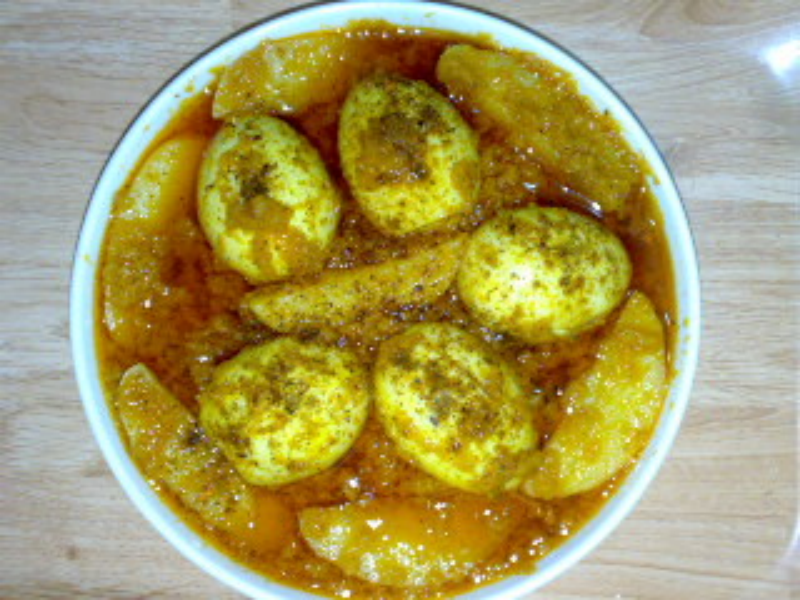 * we make slits in the egg so that the masala enters the eggs.